Heritage Society Salutes "Unsung Hockey Heroes"
Providence, RI (4/1/2011): The R.I. Reds heritage Society and the R. I. Interscholastic League (RIIL) christened its 1st annual “R. I. Reds Hockey Honors Award” program. 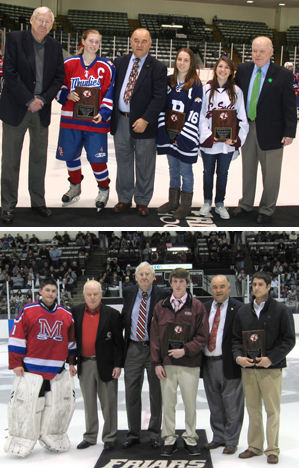 The award categories honored three senior boys and three senior girls who participated in RIIL’s varsity hockey programs in 2010-11. Players honored in the boys’ division were Daniel Foster, goaltender, Mt. St. Charles Academy; Shane Studley, defense, Barrington High School; and Timothy Ryan, forward, LaSalle Academy. Recipients in the girls’ division were Kathryn Varone, goaltender, LaSalle Academy; Caitlin Bray, defense, Mount St. Charles Academy; and Kerri Nadeau, forward, Ponaganset High School. The three category awards are named in honor of former Reds’ greats Gil Mayer (goaltender), Ferny Flaman (defense) and Chuck Scherza (forward). Those chosen were recognized for their “Unsung Hero” performances at the state playoff games played at Providence College’s Schneider Arena on March 17 and 19. The selection committee was made up with representatives from the hockey coaches association, the RIIL and the R. I. Reds Heritage Society. Rick Scherza and Tom Army represented our Society. For individual profiles of the winners, Click Here. Top, from left, Heritage Society President Buster Clegg, Caitlin Bray of Mount Saint Charles Academy, Society Director Roch Scherza, Kari Nadeau of Ponaganset High School, Kathryn Varone of LaSalle Academy, and Society Director Tom McDonough. Bottom, from left, Daniel Foster of Mount St. Charles Academy, Tom McDonough, Buster Clegg, Timothy Ryan of LaSalle Academy, Chuck Scherza, and Shane Studley of Barrington High School.